Aneela Fazal is a self-taught contemporary artist from Portland, Oregon. Her modern compositions use color, texture, and energetic brushstrokes to evoke emotion in the viewer. Her art possesses a vibrant and powerful energy, created with a carefully balanced pairing of strong and loose impressionist painting style. 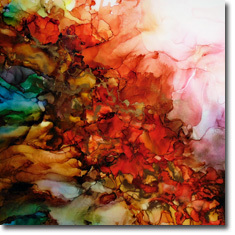 My art is about experiences, subjects imperfect and raw, abstract and modern; yet always reflect a sense of joy. Like a writer says it with words, I paint my feelings and emotions onto the canvas. I tell stories of inspiration through my art, one painting at a time. My recent series of work is close to my heart. It’s called “Outside the lines” and my daughter is the inspiration behind these pieces. As she has taught me how to looks at imperfections in a way that makes your imagination take you to a place you have never experienced. Just like my color palette for this series, me and my daughter are complete opposites, while I like to stay very organized, and have a systematic way of thinking, my daughter has taught me to look beyond and break some rules and I have found out it has been liberating and a lot of fun. The medium I am using is fluid ink and as it meets the canvas it has a mind of its own, as an artist I love this unpredictability. If someone took art away from me, I would not have a voice any more. Art is a medium I use to convey what I am feeling in my world, and I want others to find their own stories in my art. I want people to be drawn to my art and evoke a sense of joy when they look at my pieces. Growing up as a kid I was always the one wanting to spend hours in my room surrounded by my 17 dolls and paint for hours. I would find reasons to paint and create art. And that has been a constant throughout my life as an artist. 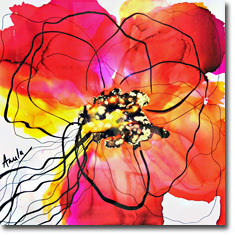 Robert Paul Galleries is proud to show the works of American artist Aneela Fazal.